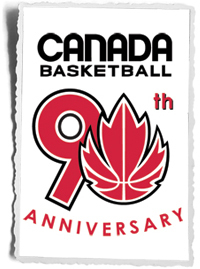 (Toronto, ON) Canada Basketball is celebrating its 90th anniversary! The country’s national governing body in the sport of basketball commemorates 90 years of hoops at home with the launch of a national multimedia campaign to provide fans with the opportunity to show that Canada’s Got Game. Fans of any age or level of skill can show the country how innovative they can be when it comes to the game they love. Whether they are on the court with a ball or at home with a rolled-up pair of socks and a laundry basket, Canada Basketball invites fans across the nation to film their shot and share it online with the world to show that Canada’s Got Game – that #WECANBBALL. As the year unfolds, Canada Basketball will launch a series of initiatives in recognition of the past while tracing the journey of The Maple Leaf on the court. In Canada, the game has seen an unprecedented level of growth and development in recent years. From children playing on the local court to the Senior Women’s National Team at the London Olympics; from high school hoopsters to a record eight Canadian players in the National Basketball Association to start the season – the country continues to show its support and dedication to the sport that a Canadian invented. It’s time for Canadians to show the world they’ve got game. We want to see your best shot. Use anything, anywhere: put a ball in a hoop, paper in a wastepaper basket, socks in a hamper, etc. – get creative and have fun. For a chance to win amazing Canada Basketball prizes, upload your video to basketball.ca. Then share your video with Canada Basketball and the world on Facebook and Twitter. For more information, visit www.basketball.ca.